After thousands of dives all across the globe – still, when I entered the Danube River Delta it was like a whole new world opened up for me. To be honest, it blew me away. The high variety of environments and habitats, all in various stages of the process of consolidation, an underwater flora creating dream-like landscapes I’d never seen before, abundance of fish life and some underwater creatures looking more like they came straight from a space cartoon for kids. Like I said – the delta’s nature took me by surprise. In the Danube Delta it is not the single species that stand out, it is the whole system, the whole delta that is mind-blowing with its completeness. Watching the river from the boat: Christian Mititelu and Florin Moisa. Well, we were already in the second half of the mission and I was desperate enough to try. 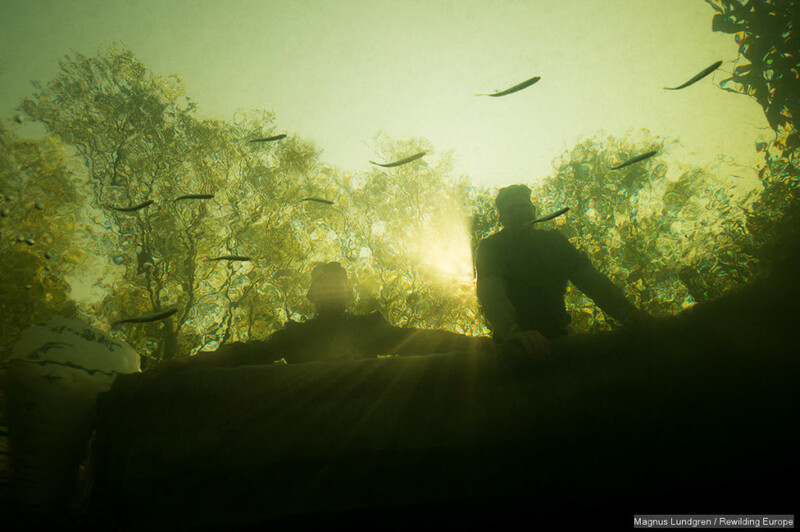 Christian and Florin hung on to the gunwale to avoid falling off the wonky boat as I plunged into the running water. It was a hot day and it was a great relief to enter the cooling currents. I stopped at two metres depth at the edge of the reed where sun was playing behind the straws and schools of fish swarmed through the scenic light. I let go and drifted out in the middle of the river to find a deep cavity. The bottom was completely covered by old snail shells creating a desolated moon-like landscape. I checked my dive computer – nine metres deep. I just found my perfect hide from the running river and as my eyes adapted to the low light I discovered yellow sponges growing on a huge tree trunk. After ten minutes a loose group of breams passed on the deep side and a pack of perch and roach came swimming along the bottom. They all looked for food in the sediment I stirred up while holding myself in place. 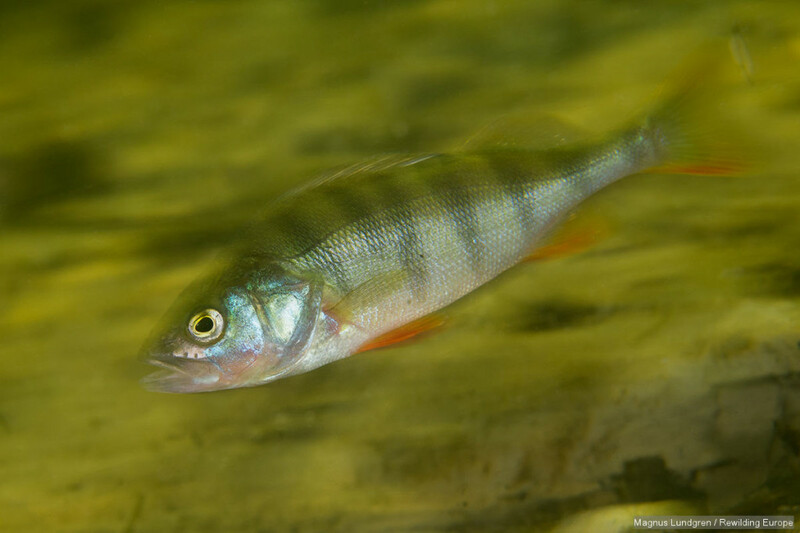 European perch (Perca fluviatilis) travel in small groups and is quite common in the Danube Delta. My regulator, mask and camera rig was wobbling in the current as I switched on my top mounted searchlight. In the extra light I found delicate fresh water gobies among the stones and a minute loach, probably a Balkan loach, on the gravel bed. My air supply was running lower and it was time leave. The way back up was exciting and after a short drift I ended up in a calm section in the shallows with teeming fish life around the weeds. Finally I had found a place with large fish and I returned the last days to this favourite place that we dubbed the Fish soup. The meeting point of terrestrial and aquatic environments boosts an extreme diversity and biological production in the delta. Most people know about the rich birdlife with more than one million wintering birds and 300+ bird species nesting or migrating through during the warmer parts of the year. The plankton-rich water is the basic fundament for life in the region and it is inhabited by worms, molluscs, insects, grubs and even fresh water sponges as well as a very rich fish life including species like carps, Danube mackerels, sturgeons and sterlets to just name a few. The delta hosts over twenty natural ecosystems, that include a complex web of streamlets, channels, lakes and swamps. And in the borderlands where freshwaters and seawaters mix there are very special processes taking place, which biologists call “beforedelta” which is noted in red in my “important-area-next-time-I-visit-Danube-Delta” list. 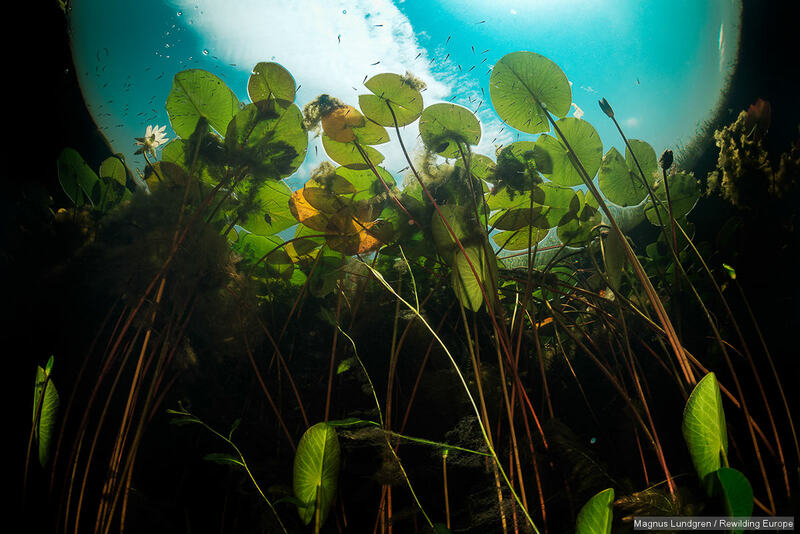 European white waterlilies (Nymphaea alba) in a tributary of Danube Delta, Romania. White waterlily is an aquatic flowering plant of the family Nymphaeaceae. At night underwater photography can be very rewarding as there is a night shift that kicks in. And some shy animals then change behaviour and suddenly become approachable. I could sense some hesitation to my night diving idea from both Cristian and Florin as I approached the subject. Navigation at night in the delta is not the most popular activity but I managed to convince them in the end. That dive became a complete success and it was probably the most memorable dive of the whole Danube Delta experience. At a much closer range than I really wanted I was photographing extraterrestrial looking beings. Water tigers and water beetles hunting, dragonfly nymphs in ambush ready to strike, tadpoles hiding, frogs sleeping, juvenile newts searching for water boatmen to eat, sleeping pikes and swarming fish attracted by my night light. At one point I found myself entangled in weed at the same time as thousands of bugs, fish and some big leeches buzzing around my face. I had to use the good old mantra “stop – breath – think – act” to back out slowly out of that mess. The night dive is my most “different” dive in a decade and I was overwhelmed and a bit scared at the same time. 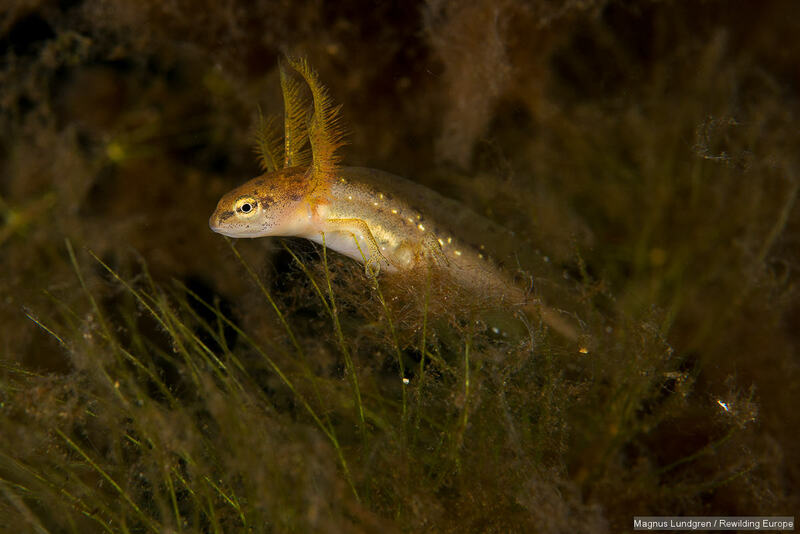 A minute smooth newt (Lissotriton vulgaris) in its larva stage. The gills are still on the outside of the body making it look a bit like a 20 mm long dinosaur.